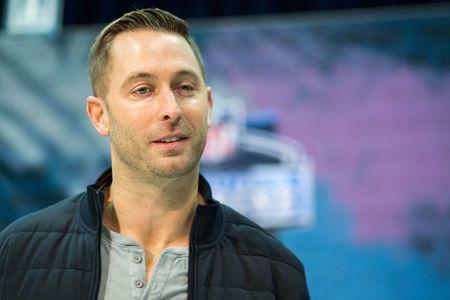 If first-year coach Kliff Kingsbury knows who his Arizona Cardinals will select next month with the No. 1 pick in the NFL draft, he isn't letting on. In an interview with NFL Media this weekend, Kingsbury said the team hasn't made a decision. "I think everything's on the table," he said. "When you have that first pick, you've gotta turn over every stone and look at every scenario that's out there, and so we're definitely doing that." One frequently mentioned possibility is that the Cardinals - who selected quarterback Josh Rosen with the No. 10 overall pick in 2018 - will choose Kyler Murray, the Heisman Trophy-winner from Oklahoma and trade Rosen. But Arizona, which finished an NFL-worst 3-13 last season, has a number of needs on both sides of the ball. The Cardinals scored a league-low 225 points while surrendering 425. "We haven't (decided)," Kingsbury said. "We haven't. We're a long ways from that. You know, coaches on the road, scouts from the road, private workouts, pro days. And we won't even discuss until next week and try to fill our board and go from there." The Cardinals' brass met with Murray in Oklahoma last week. At the same time, Kingsbury said he is high on Rosen, calling him a "tremendous talent." A former QB himself, Kingsbury said he has communicated that opinion to Rosen and also talked about the draft. "Yeah, I've talked to Josh and he understands it's a business and what all goes with the first pick and what's going on," Kingsbury said.